Pee Dee AHEC Health Careers Academy (HCA) students channeled the spirit of the season in December and volunteered to spread the holiday cheer. These future healthcare professionals worked together to give stuffed Christmas stockings to children in the McLeod Children’s Hospital. “Giving and wrapping gifts and stockings for the children in the hospital is a really amazing thing because I want to help kids one day as a pediatric nurse practitioner,” said Megha Patel, an HCA junior. 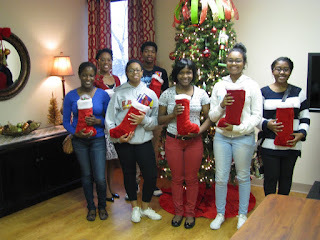 The Academy students gave more than enough for the children’s hospital. The extra gifts were donated to the House of Hope and the Chrysalis Center in Florence. “Helping with this project just shows that not only do I want to help people in the future, but I also want to help people now,” said Darrian Gardner, an Academy sophomore. For more information about the Health Careers Academy, please contact Health Careers Program Coordinator Larrissa Clavon at lclavon@mcleodhealth.org.